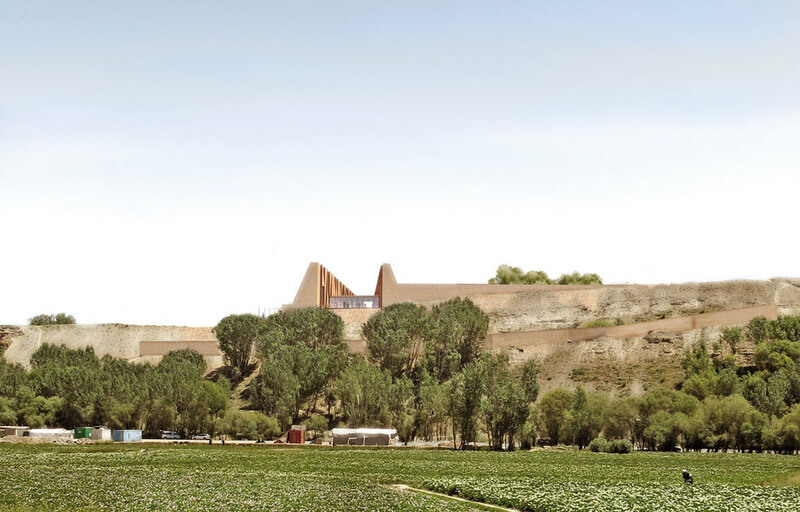 Our proposal for the Bamiyan Cultural Centre concerns more a landscape operation than a building construction. In a so strong natural and anthropic context, every human building has to deal with land morphology and often it has to modify it. Walls are an important feature of the landscape and the competition brief requires a fenced area protected by walls. We propose to bend over these walls inside the project area to define a long outdoor ramp connecting the two levels of the site: on the south side of the ramp the cultural centre works as a retaining wall which supports a rear garden on the highest part of the site, on the north side of the ramp a stretched building hosts the exhibition spaces, open to the lower garden where it can be arranged an outdoor exhibition space. From the Buddha Cliffs, the Cultural Centre looks more like a complex arrangement of huge retaining walls than a freestanding building, involving the walls, requested on the site borders, in a coherent landscape re-shaping. All that in order to point out the exceptional nature of the landscape and not to spoil it with a loud iconic landmark. This large ramp, which digs a groove in the middle of the site, plays a semi-public role where people, while attending their different activities, can meet each other before they enter into the building. This void is the centre of the building, as the inner courtyard of the traditional “Qala”, and it spreads itself towards the timeless panorama, generating the small rotation of the exhibition wing. At the top of the ramp, few openings interrupt the walls and allow to enter the site by crossing the entrance checkpoint. At the bottom of the ramp, the void is delimited by the reception/lobby, a small glass volume that crosses the void and connects the two wings of the Cultural Centre. We respectfully deal with the environmental context, as well as we do with the anthropic context, trying to give a new look to traditional building know-how and materials. We designed a wooden structure to carry the roofs and to frame the walls made of clay bricks like the traditional “pakhsa” walls.This traditional technique is updated by manufacturing compacted-clay elements like the ones realized in Europe by Martin Rauch. That would encourage the developing of new manufacture skills in the Valley. This prebuilt compacted clay elements are covered with traditional handmade mud bricks on the outside. On the south façade we propose to control the sunlight supply by using traditional brick with regular perforations, while, on the opposite side, the north façade has been oriented to obtain an indirect light effect inside the exhibition area so that the direct sunlight only affects the reclined wall during the daytime.